The Notebook allows for data collection as a part of ARIS. This can either be a standalone use for ARIS (e.g. sending a group out to take pictures of all the Ash trees in the neighborhood) or integrated with the storytelling and gameplay aspects of ARIS. What is the Notebook For? All the author needs to do to enable note taking is help their players find and use it within ARIS. If you do not use the Notebook in your design, you may want to learn how to turn off it and other unneeded tabs. Authors may, but do not need to, create tags (really categories) for notes in Game > Tags. In Game > Settings, the author can additionally decide whether to allow players to like and comment on each others' notes. Search by Tag - Tags will only show up for players if the author has created at least one tag. Wait until uploading has finished, especially with videos (spinner next to phone signal goes away). Otherwise upload may silently fail. Streamlined interface for authors and users - If all you want to do is data collection, you can be up and running in five minutes with no technical training. You can't put any hooks around or establish much experience or context around the data gathering, at least inside the tool. No reason you can't do this with paper though, or maybe even stuff siftr inside an ARIS game via a web page object. You are limited to images and text, and you only get text if you also upload an image. Clutter exists because every note is marked on the game map for all players. 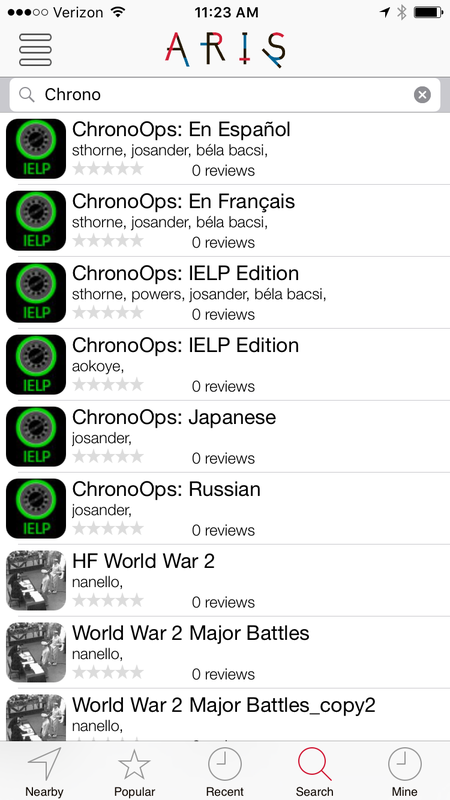 This can be useful for viewing notes later, but it can really get in the way too. ARIS will continue to evolve, so this clutter may eventually be less of a problem. But there are some things that you can do right now as an author to clean things up for your players. Notes only show up on the map in the scene where they were created. If you have non-notebook game content, you can segregate it from the notes people leave behind by making sure that your players only are making notes in a different scene than the one where they are following a map to get places. Here’s a simple example. Let’s say you have a basic tour, at the end of which, you’d like players to leave a video comment by using the notebook. Tour would be the “starting scene” (set in the game’s settings, or when authoring new scenes, or by double clicking the scene title in the Scenes tab interface). All of your tour content would go here. Notes would be where your players make and see notes. 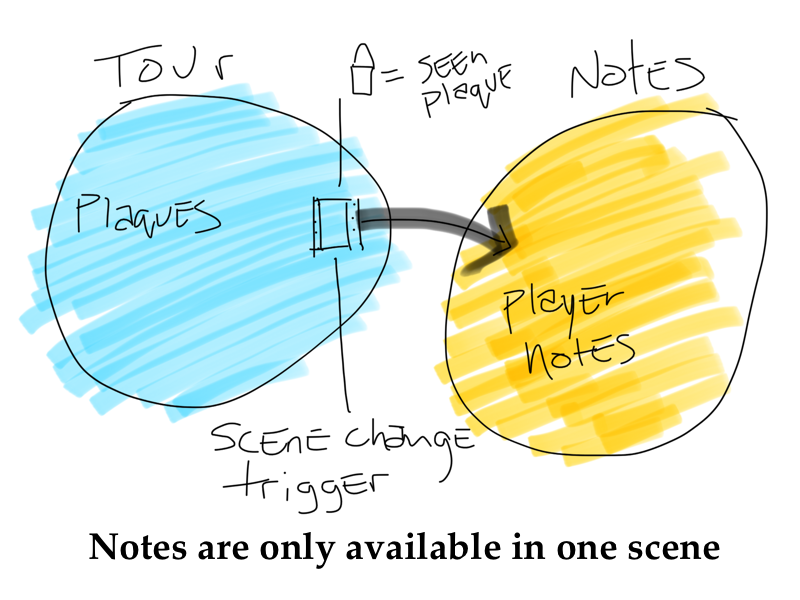 You need a “scene change” trigger in the Tour scene that goes to the Notes scene, with a lock that will keep the player in Tour until the appropriate moment. In this example, let’s say you have a final plaque as part of your tour that thanks the player and invites them to leave a comment. The “scene change” trigger above would have the lock: -player has already seen final plaque-. In the above example, players would likely be leaving their notes in the Notes scene because you are telling them to and they are not likely to find and use the notebook on their own. However, it is still possible for them to create notes in the wrong scene. But you can prevent this by putting appropriate locks on the Notebook tab. You can place locks on the Notebook (or any other player UI tab). Go to Game > Tabs. In this case, you would likely want to use the same lock as your did with the “scene change” trigger. The scene-switching trick should work nicely in many situations to keep authored game content visible even in games where there is a lot of Notebook use. What it doesn’t do is keep the notes themselves from cluttering a map of only notes. 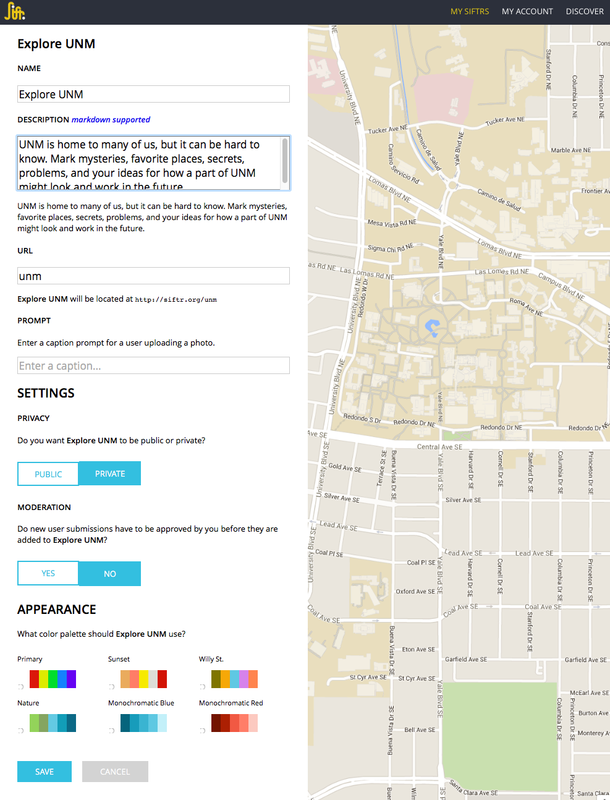 The redesign of siftr, like the photo map feature in Instagram, does some nifty things to avoid this problem, and ARIS does not have those features. But depending on your use case, there may be again a way to put a little forethought into your design to limit the impact of note clutter: Having each successive audience play a new clone of your game. In Game > Settings, there is a “Duplicate Game” button. This will create a brand new clone of your game. The clone starts with the exact same title. Make sure to retitle right away so you don’t get confused about which clone is which. Player created content (e.g. notes, player, world, and group item quantities) do not get recreated in the new game. Only the author who creates the clone inherits permission to edit the clone. If you run your game with successive test groups, separate courses, etc. this may give you a nice way to give each group a pristine experience. If you’re worried about cluttering the “game picker”, just make sure only the current copy is marked as “published” in Game > Settings.